Dancer, creator and contemporary dance teacher. Graduated as BPA (Hons) in Northern School of Contemporary Dance-NSCD (England). Continued her training in Spain, England and several European countries with teachers in several contemporary dance techniques. Has worked with different choreographers such as Douglas Thorpe and Sonia Rodríguez. Focused on her own creative proposals since 2013, she originates solo pieces like “D-Construction”, “Volubilidad”, “Preludio”, “Régénère” and “Y también mañana”. In 2015, she is granted with an artistic residence in the cultural non-profit organization SOLAR. Acción Cultural, where she developes Régénère. In July 2015 takes place another residence in ‘L’Estruch Fábrica de Creación’ in Sabadell, along with Anna Borràs, creating “Black Spot”. In July 2016, she became part of the project driven by Laura Marrero El Compromiso, focused on scenic improvisation, fostered by the mini-residence program ‘333,333’ in Leal.LAV. Has worked also as member of Tenerife Danza Lab, resident in Auditorio de Tenerife, developing and broading posibilities in the contemporary dance field: creation, performance, pedagogical aspects and research in creative processes. 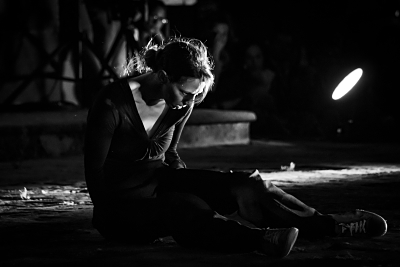 Currently, she is member of the project ‘Danza en Comunidad’ of Auditorio de Tenerife, and keeps developing personal creative projects, teaching contemporary dance and looking for new research lines from movement languages. During 2018 he has premiered two new works: “Takten” with the pianist Esther Ropón, and “Irreverente” with the dancer Laura Marrero, creating the company La Reversa, with Alfredo Díez as lighting designer.